Breaking through the art world has never been more challenging. Folding or merging art galleries and limited government funded art programs are making the competition extremely high along with the saturation of artists producing and showing artwork. The intensely competitive art market is pushing artists to team up and seek opportunities together toward shared goals, resources and support. 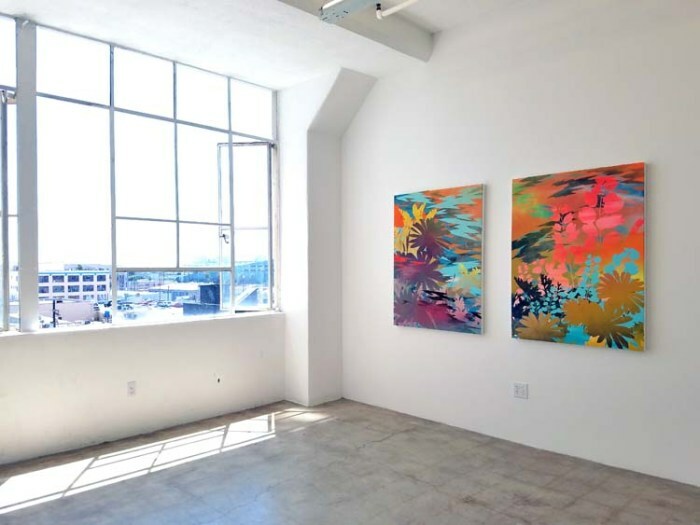 Although the concept of an art collective is not new, it is however becoming more popularized, playing an integral part in the artist communities of Los Angeles. These groups are collaborating, showing and curating exhibitions in private and public arenas, creating their own opportunities. We’ve asked 9 collectives in Los Angeles how they’re creating opportunities for themselves as well as other artists and their communities. Each member of the collective is required to curate at least one exhibition a year, either in the Durden and Ray gallery or outside of it. This creates exhibition opportunities for many artists. Also, we focus on creating exchanges with other galleries across the country and the world, which creates opportunities for Los Angeles-area artists to be seen outside of the region, and opportunities for artists from other places to be seen in Los Angeles. Durden and Ray. Beset on All Sides. Photo Courtesy Durden and Ray. We are a collective of 40+ artists living and working in Philadelphia, New York City, Chicago, and Los Angeles. There are 11 artists at our LA site located in the Bendix Building in downtown LA. We all pitch in from each space nationally so we can put on the best and boldest shows humanly possible between all of us. Advancing the lives of feminist artists. The Association of Hysteric Curators (AHC) envelops a fluid, evolving, trans-generational group of artists who gather to discuss contemporary feminism and the historicity of the term. We seek to explore notions of female protest and the presence of gendered articulations through a non-hierarchical structure based in dialogue and exchange. As we honor the lineage of feminist models, we dare to envision a future of human equality, knowing we must interrogate the customs of today in order to enable conditions for change. As a working model, we understand that democratic consensus is slow and laborious in comparison to the type of fast paced and often decentralized systems found today. The reduced pace of our methodology allows for ideas to ebb and flow through on-going conversations aimed at process over product. We are invitational and open, focused on explorations of female power through vistas of holes, blanks, ruptures, and catastrophes. As an agent of chaos and change, we posit our curatorial agenda as a figurative fault line; our research a body of water formed in a valley between two plates; our legacy the large-scale lateral movement along hundreds of miles of the fault: watch us as we spread and break down barriers, expanding and amplifying our space in society. The Collectivists at the Brand Library. Mary Anna Pomonis & Allison Stewart. Association of Hysteric Curators. Photo Credit Kristine Schomaker. 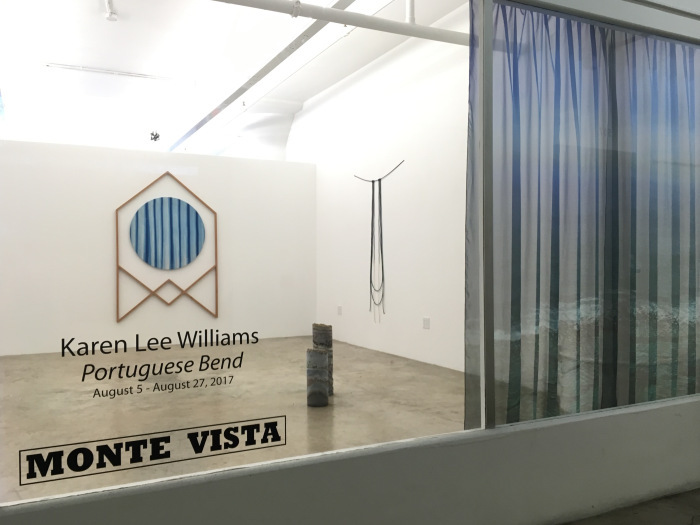 Monte Vista Projects is an artist-run space. Through exhibitions, lectures, events and performances, MVP has served as a space to share ideas and cultivate exhibitions articulated in experiments and play. We also encourage forms which break entirely from these existent threads. MVP is a self-determining space– a space that speaks to the ways in which we are scripted to produce as artists and creatives. We believe this position allows us to visualize patterns of making in order to break from them. Since 2007, MVP has collaborated with artists and practitioners in and around the greater Los Angeles arts community. We are especially interested in working with under-represented artists and minorities. In addition to curated shows organized by board members, exhibition proposals are accepted year round. Monte Vista Projects. Photo Courtesy Monte Vista Projects. Sixpack Projects is a collective of six artist/curators organizing innovative contemporary art exhibitions and events throughout Southern California, providing opportunities for both emerging and established artists to exhibit work and engage the public in open dialog on contemporary issues. Having no permanent exhibition space to call our own, we partner with a variety of existing galleries and other venues to host exhibitions on a temporary basis. Exhibition projects often are curated around a particular theme, respond to current events, and/or offer specific prompts and opportunities for artists to respond with new work. The Prison Arts Collective is a project of Arts in Corrections, an initiative of the California Arts Council and the California Department of Corrections and Rehabilitation, dedicated to collaborating to facilitate arts in prisons. We are committed to academic activism and supporting the development of self-expression, reflection, communication, and empathy in individuals that are incarcerated through integrated arts programs that include art history, art making in diverse media, and multidisciplinary projects. We facilitate weekly programs in prisons that would not otherwise have access to art. We also provide an Arts Facilitator Training to inmates at two prisons to support them in facilitating classes for their peers. We also organize exhibitions for artists that are in our program; the second one, “Beyond the Blue,” is on view at CB1 Gallery through September 2, 2017. Current members: Annie Buckley, founder; April Baca, Christina Quevedo, Jessica Agustin, Diana Hernandez, Diego Irigoyen, Margarita Esparza, Jenny Montenegro, Ashley Woods, Rebecca Chrisler, Azzir Hassan, and many others inside prison and out. Members of CSUSB Prison Arts Collective in a visual arts class at the California State Prison, Los Angeles County. Photo by Peter Merts. Los Angeles Art Collective (LAAC) is a group of emerging artists that represent the nuances and diversity of Los Angeles culture. Like the freeways that make up LA’s terrain, our work is informed by the city’s urbanization. Together, our distinct voices echo the diverse communities and multifarious architecture in the City of Angels. Our mission is to create large-scale collaborations that blur the boundaries of artist, community, space, medium, and identity. From live mural painting to video projection mapping and performance, our multi-disciplinary artists have one common theme: our relationship to this unique city. We work with local festivals, institutions, and museums. 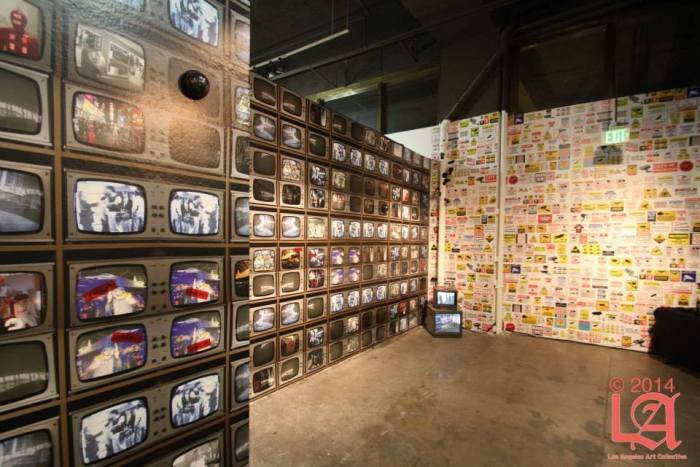 For example, we curated an exhibition at the A+D Museum titled, “Beyond Graffiti II” (http://www.laartcollective.com/projects/). LAAC created various video projection/installation/performance pieces for the show. We created a large interactive installation for our solo show at Los Angeles Center for Digital Art. More recently worked with Museums and the Web to exhibit our work at the Biltmore Hotel and The Broad Art Museum (Tiffany Trenda’s performance Ubiquitous States). We will be working on curating a large-scale exhibition of performance, graffiti art, and interactive installations in Downtown Los Angeles. Active members: Eder Cetina, Victor Solomon, Tiffany Trenda, Paul Wehby, and Carlos Ulloa. Rough Play curatorial group was born out of a dialogue that began with a debate on the increasing demand in contemporary art for the artist to combine artistic practice with academic research. Kathrin Busch stated, “Art and theory, in effect, are nothing more than two different forms of practice interrelated through a system of interaction and transferences.” Challenging the artist to function in this reciprocal practice enables a constant examination of one’s own work and the need for an exchange of ideas, perceptions, and results. Inevitably, this process lends itself to collaborative exploration. We began with the understanding that for us to have viable opportunities in today’s art world we needed to create a new path, one that leads us to pursue options outside of the traditional exhibition venue. In order to be effective in our pursuit, we found ourselves embracing the role of curator, which in theory, perhaps contained an inherent conflict with our artistic practice. This conversation led us to examine traditional curatorial practices. By approaching the process as a collaborative invitation, we delve into a unique opportunity for creating new models and transformative exhibitions. We are a collective of artists who work together to produce exhibitions, not so much in a traditional top-down curatorial way in which a curator requests a work for a show, but rather, we have been allowing for a process to develop organically in which we look for artists that are making work in the spirit of an exhibition concept, invite them to participate, and allow them to propose existing or new work that responds to the exhibition space and ideas put forward in the show concept. The artists have the opportunity to contribute creatively to a living exhibition project, which in many cases, has resulted in ambitious new work and interesting engagements with environments. Exhibition opportunities have come to the group through a variety of sources, all that come back to our roles as active artists with connections to various artistic communities. Out of three completed and one upcoming project; we applied for one; we were invited to do one; one came about through a relationship with a gallery; and the last one, which will be the most collaborative yet, is being created entirely by us. Rough Play. Without Design or Sketch: The Story of the Room Installation at Launch LA. Photo Courtesy Rough Play. 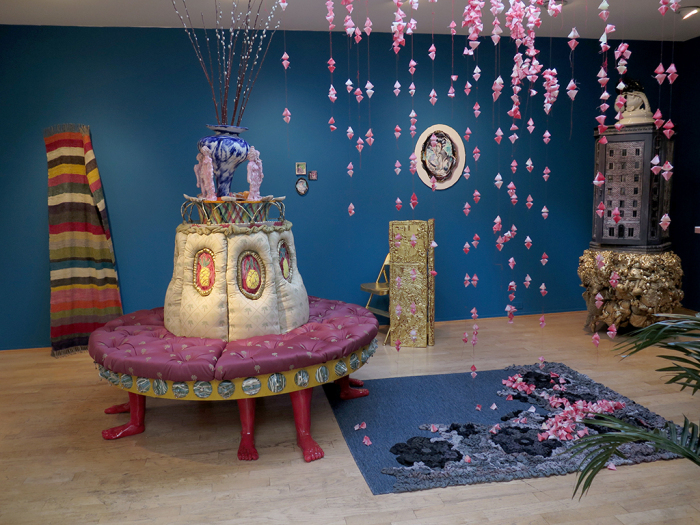 Our mission as a curatorial collective is to form connections with other artists through thoughtful exhibitions. As a curatorial collective made up of four women who are also artists, we strongly believe in championing other women along with showcasing work by underrepresented artists. In addition, we like to support artists that might have more unconventional artistic practices and/or are interested in site specificity. We consider curating to be a place that we can begin a dialogue with each artist that we intend to work with and we try to foster those relationships that we develop when creating shows. We often continue to work with artists more then once to understand their processes and help them execute their vision. We want to create opportunities for the artists that we are exhibiting. We do not have a physical space that we operate out of or host shows at. Rather, we often plan exhibitions far in advance, find locations, pitch them to venues, and apply for grants to raise funds for the shows. In some cases, we will be invited to curate an exhibition at a specific venue and we will use that place as a starting point. We also have produced catalogs and zines, which have allowed the exhibitions to have a life beyond the physical duration of a show. We are really active in the community and have close relationships with some of the artist collectives and artist-run spaces in Los Angeles. We strongly believe in supporting each other and the artists that we are exhibiting. This creates a fulfilling conversation, which we think is the objective in the end. 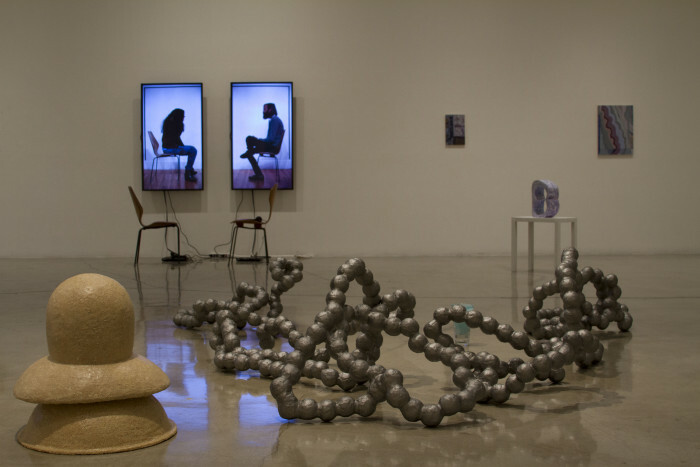 Installation View from “Are Friends Electric” at Claremont Graduate University, Peggy Phelps Gallery, 2014 – featuring artwork (left to right) by Nancy Lupo, Jay Erker, and Rema Ghuloum) Photo Courtesy Manual History Machine.